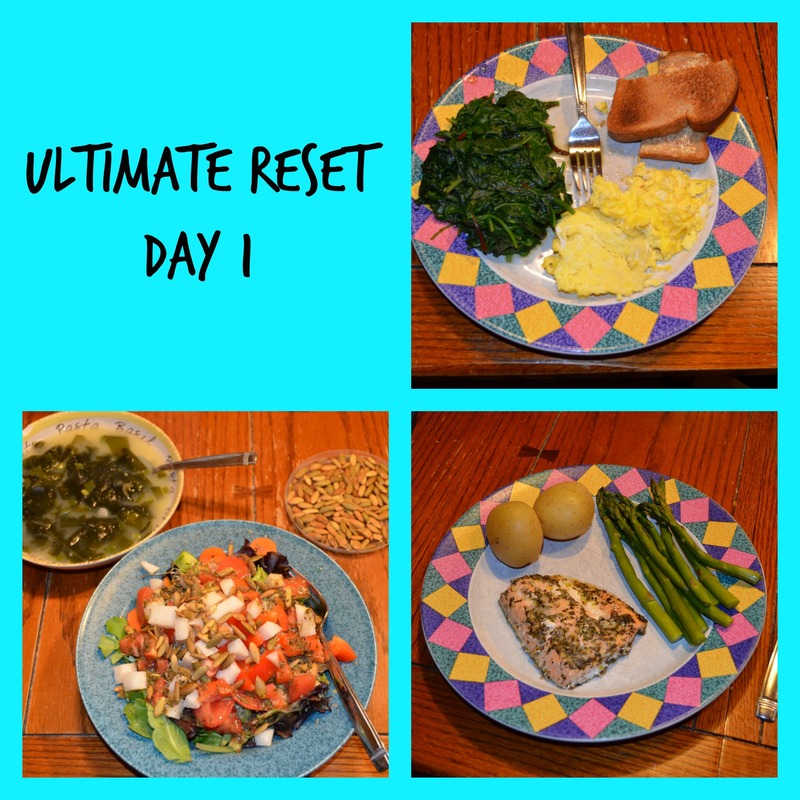 Today my husband and I started the Ultimate Reset….. I started off yesterday shopping for all our foods for the week. Because I have not bought many of the itmes on the list it took me a very long time shopping and then I spent the evening in the kitchen starting to prep some items. I still have kids to feed and help with homework, so although I wanted to prep it all after shopping for it all that did not happen. I was in the kitchen from 4pm-9pm, in and out as I sat with kids doing homework, preparing our family dinner for Tuesday night and then prepping 2 salad dressings, miso soup, and chopping veggies for the week. This morning started off great, alarm went off…I snoozed it of course 🙂 Then up and drinking my first 12 oz of water and taking Optimize (vitamin form, enzymes). Breakfast needed to be made and served at 7, but I got caught up in reading and it wasn’t served until 7:45. That meant hubby had to eat his huge plate in 5 minutes flat! Eggs, toast, and Kale ~ it was so yummy and I was full and satisfied. No need for any morning snack. Around 10 another glass of water with Optimize. Then comes lunch and Seaweed soup is on the menu! Yuk!! Miso Soup, it was ok. Not a meal I will plan to eat because I like it or want it or am craving the taste. Got a huge Salad and some toasted pumpkin seeds too, now that’s definitly something we’d eat over and over again. We love big salads, and anything goes so you can have fun and variety everyday of the week. Again, no need for a pm snack….we actually couldn’t finish our lunch, it was too much and we we’re already full and satisfied from breakfast. Oh Boy, next up around snack time came the lovely and green “power greens” drink. First up a glass of water, then….it was so much worse than I anticipated. I could barely drink it, it smelled bad and it tasted even worse. I jumped around my kitchen as I took big gulps and said over and over “I can’t drink this stuff”!!!!! I have 20 more packets of these greens that need to go down every afternoon, NOOOOOOO! I just need to remember, WHY I’m doing this. I’m doing this for ME and my future self! !